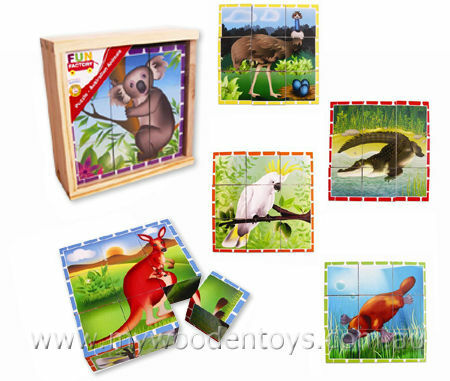 Australian Animal Block Puzzle is six puzzles in one on different sides of nine blocks. This sweet cube puzzle is made from beautifully smooth wooden blocks with fantastic Australian theme pictures on them. There is a cockatoo, emu, kangaroo, platypus, koala, and a crocodile. Once you have lined up all the blocks to make one of the pictures if you turn the blocks in a certain order the next picture appears and so on. This set of block puzzles comes in a very sturdy wooden box with a perspex sliding lid. Material: Wood with gloss paper finish. Perspex lid. We like this because: "Like magic if you turn the blocks in the right order"